Iron Man: Courtesy Marvel Entertainment, All Rights Reserved. Not very, if you are talking about what you see on the Silver Screen. We are not likely to see Special Forces flying around in near invulnerable armor firing “repulsor rays” anytime soon. However, if you mean a powered exoskeleton that provides ballistic protection as well as augments strength and stamina, well then, we are pretty darn close actually. As far back as 2001, The US Defense Advanced Research Projects Agency (DARPA) kick-started development of military exoskeletons under the Exoskeletons for Human Performance Augmentation program. For the next five years DARPA funded exoskeleton R&D to the tune of $50 million dollars, yielding two promising results: Raytheon’s XOS 2 and Lockheed Martin’s HULC. raytheon xos 2. Photo courtesy Raytheon. The XOS 2 uses lighter material and is about 50% more energy efficient than its predecessor, the XOS 1. It uses a combination of controllers, sensors, high-strength aluminium and steel, and flexible hoses to provide strength and fluidity of movement. Using the powered limbs, the wearer can lift about 200 pounds of weight for long periods of time without feeling the strain, even while standing on one foot! The soldier wearing the suit can walk or run while carrying the load. The exoskeleton is strong enough to allow the wearer to punch through wooden boards three inches thick without injury, but is light and agile enough to allow the wearer to climb trees, run up a flight of stairs, or kick a football. However, while that is impressive, because the wearer still needs to do all of that while tethered to power and hydraulics, the company is expecting to rollout the suit not for combat, but for logistics. On average, logistic and support military personnel lift about 16,000 pounds of gear, cargo, and other loads every day. The XOS suit will ease the logistics burdens faced both in theatre and base side. The soldier wearing the XOS 2 exoskeleton can perform the work of three soldiers, improving efficiency of load operations. It will also reduce back and orthopaedic injuries common in load operations. 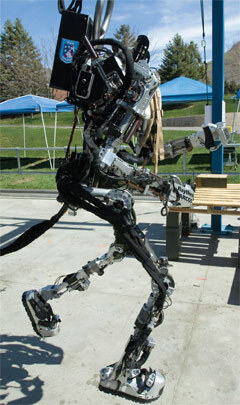 Raytheon believes it will be fielding the tethered version to the US military by 2015. They have in development, and will be able to deliver, an untethered version by 2020. Lockheed Martin’s Human Universal Load Carrier, or HULC, may not be a green, gamma charged behemoth, but it is nonetheless pretty incredible. 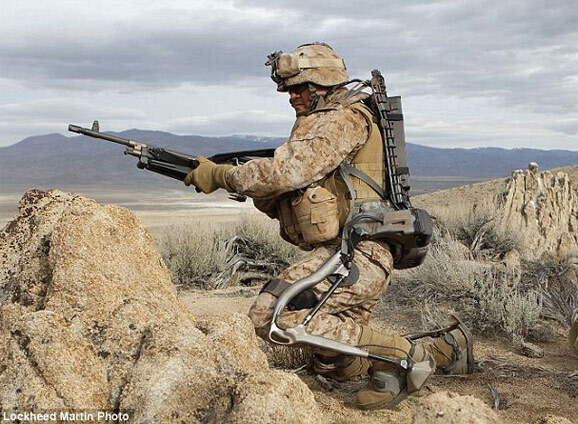 In 2011 the company successfully tested the HULC, a lightweight wearable exoskeleton that allows a soldier to lift and carry a sustained weight of 200 pounds, and to run at a steady 10 miles an hour in “burst mode” – all untethered! 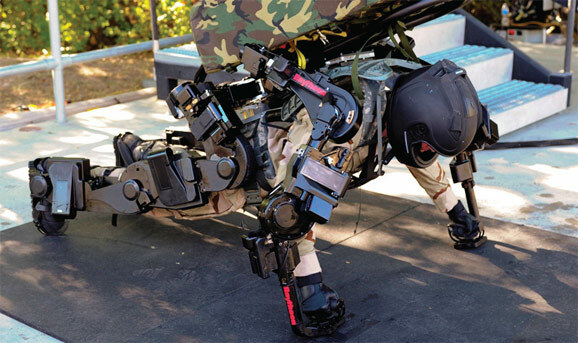 The suit is now under advanced testing and further development at the Natick Soldier Research, Development and Engineering Center in Massachusetts. There is no estimate given as to when this HULC may be called upon to “smash” on the battlefield, but a recent CNN report showed how a civilian version of the technology, developed by Ekso Bionics, based in Richmond, CA, was able to return mobility to a paraplegic. Ekso also had its start as a military load-lifter under DARPA funding, but the company’s CEO soon saw how what they had developed could help paraplegics to walk again! The suit, which is worn much like the HULC, allows a paraplegic to actually get up out of his or her wheelchair and be ambulatory. Currently it is only available for use in hospitals and rehab centers, but Ekso believes it will have units available for home use as soon as 2014. That may not be taking down baddies with jet boots and repulsor rays, but it is pretty super! LM HULC. Photo courtesy Lockheed Martin.